(2-8) The son of Vyâsadeva said: 'King Indra, enjoying the wealth of the three worlds, due to pride had strayed from the path of truth. Surrounded, oh King, by the Maruts [of the luster] the Vasus [of excellence], the Rudras [of anger], the Âdityas [of what is untrue], the Rihbus [of invention, see also 4.4: 33], the Vis'vadevas [of royal riches], the Sâdhyas [of refinement], the As'vinî-kumâras [of helpfulness] and the Kumâras [of celibacy] and being served by the Siddhas [of perfection], the Câranas [of the theater], the Gandharvas [of song], the Munis [of wisdom], the Brahmavâdis [of learning], the Vidyâdharas [of science], the Apsaras [of heaven] and Kinnaras [of superpower], the Patagas [of the birds] and the Uragas [of the snakes], King Indra was served and glorified with sweet songs, oh son of Bharata [compare 2.3: 2-7]. In his assembly hall he [one day] was sitting on his throne enjoying the royal opulence of a white parasol as beautiful as the moon disc and other regalia and amenities such as yak-tails for fanning him. Shining with his wife S'acî who shared the throne with him, he thought he was the one supreme. But when his exalted teacher of example, the spiritual master of all the godly souls, appeared in the assembly, he was not welcomed by him. He did not stand up from his throne to offer him a seat or greet the great priest of the godly ones, the best one of the sages who was equally respected by the enlightened and the unenlightened souls. Even though Indra saw him enter, he failed to pay him any respect. Third revised edition, loaded September 19, 2018. The son of Vyâsadeva said: 'King Indra, enjoying the wealth of the three worlds, due to pride had strayed from the path of truth. Surrounded, oh King, by the Maruts [of the luster] the Vasus [of excellence], the Rudras [of anger], the Âdityas [of what is untrue], the Rihbus [of invention, see also 4.4: 33], the Vis'vadevas [of royal riches], the Sâdhyas [of refinement], the As'vinî-kumâras [of helpfulness] and the Kumâras [of celibacy] and being served by the Siddhas [of perfection], the Câranas [of the theater], the Gandharvas [of song], the Munis [of wisdom], the Brahmavâdis [of learning], the Vidyâdharas [of science], the Apsaras [of heaven] and Kinnaras [of superpower], the Patagas [of the birds] and the Uragas [of the snakes], King Indra was served and glorified with sweet songs, oh son of Bharata [compare 2.3: 2-7]. In his assembly hall he [one day] was sitting on his throne enjoying the royal opulence of a white parasol as beautiful as the moon disc and other regalia and amenities such as yak-tails for fanning him. Shining with his wife S'acî who shared the throne with him, he thought he was the one supreme. But when his exalted teacher of example, the spiritual master of all the godly souls, appeared in the assembly, he was not welcomed by him. He did not stand up from his throne to offer him a seat or greet the great priest of the godly ones, the best one of the sages who was equally respected by the enlightened and the unenlightened souls. Even though Indra saw him enter, he failed to pay him any respect. Brihaspati, the learned sage and master, thereupon left immediately to return home in silence, well-known as he was with the alienation of being puffed up about wealth. 'Alas, how disrespectful it was what I have done. I must be out of my mind. Now I have, infatuated with my wealth, mistreated the preceptor in the midst of this assembly! What man of knowledge would be in favor of opulence! Despite being the king above all, I, the leader of the demigods, now with this wealth have been carried away by a demoniac mentality. He who says that to sit on the royal throne means that one should not stand up for someone else, has no idea of the higher [meaning] of dharma [compare 4.2]. They who lead the way on a false path will land in darkness themselves and anyone who puts faith in their words, will go down also, sinking like a boat made of stone. While Indra, the mightiest god of all, was ruminating thus, Brihaspati disappeared from his house, not being seen because of the power of his elevated state. Vigorously searching all around not finding a trace of his guru, the mighty Indra, being helped by his associates and contemplating his wisdom, could not find any peace of mind. When the mass of unenlightened souls, who kept to the precepts of S'ukrâcârya, heard about it, they took, not that smart, up their weapons and declared war against the godly ones. With their trunks, arms and legs being pierced by the sharp arrows shot, the God-conscious souls together with Indra took refuge with Lord Brahmâ and bowed their heads before him. Seeing them weighed down by their worries, the godhead Brahmâ, the supreme unborn one, out of his causeless, infinite mercy spoke to them in order to comfort them. Lord Brahmâ said: 'Alas, what an unpleasant surprise, oh supreme enlightened souls. Because you [being too proud] with your opulence failed in your hospitality, you have committed a serious offense against a faithful servant of the Absolute Truth, a brahmin of full control. Because of your negligence with the wealth you enjoy, the others, your enemies, however weak they were [being defeated by you in the past], managed to defeat you [now], oh enlightened souls. Indra Maghavan, oh Honor of Wealth, just see how your enemies, who formerly were so weak because of neglecting their preceptor, have regained their power now they, with great devotion, are of respect for their sage, the son of Bhrigu [S'ukrâcârya]. As disciples of Bhrigu [viz. S'ukrâcârya] undivided in their resolve to follow the instructions, they are unconcerned about [the opposition of] those who dwell in heaven [up to Lord Brahmâ]. They who put first the brahmins, the cows and the Protector of the Cows [Govinda, Vishnu], will find nothing inauspicious on their way, whether they are human or divine. S'rî S'uka said: 'Thus being advised by Lord Brahmâ, oh King, they, relieved of their pain, went to the rishi, the son of Tvashthâ. They embraced him and told him the following. The godly said: 'We, arriving as guests at your abode, wish you all good fortune and would like to express the desire, oh dear son, to have, concerning the present situation of us, the elder ones of your [spiritual] family, some things straightened out. The highest duty of sons is to serve their parents as good as they can despite having sons of their own, oh brahmin, and what to say about celibate sons? The teacher of example [the âcârya] personifies the Vedic knowledge, the father stands for the Original Father [Brahmâ], the brother is the representative of the king of the demigods [Indra] and the mother is the direct embodiment of the earth. The sister personifies the mercy, the guest is there as the true self of dharma, the one invited is there as the representative of the god of the sacrificial fire [Agni] and all living beings are there to the example of the Supreme one of the Soul [Vishnu]. Therefore, by the power of the austerity that is in you, dear son, take away the grief of us, your troubled elders, who were defeated by our enemies. We recognize you as someone capable of performing this task. We have chosen you as our preceptor concerning the Supreme Brahman, as our brahmin and spiritual master, so that, based upon your prowess, we can defeat our rivals with ease. The honorable rishi [S'uka] said: 'Thus on the request of the different enlightened souls accepting the priesthood as the great example of austerity, Vis'varûpa, pleased with their honest words addressed them. Vis'varûpa said: 'Even though it [the acceptance of priesthood] is condemned by those faithful to religious principles as being detrimental to one's brahminical power, I, oh lords, oh controllers of all, as someone whose self-worth it is to be a disciple, so one says, cannot decline this request. Persons withdrawing from the world may count on the wealth of grains left behind in the field or the marketplace [s'iloñchana, to live 'on the dole']. That is how the sâdhus, acting piously in this world, succeed. But how reproachable it is for me, oh rulers of the worlds, to be of the duty of the priesthood, a duty designed to give joy to the less intelligent! The son of Vyâsa said: 'Vis'varûpa, the master of penance, thus promising them to be their priest, performed as requested his duty with the greatest attention. Even though the riches of the enemies of the God-conscious souls were protected by the science of S'ukrâcârya, the mighty sage managed, by means of a prayer unto Lord Vishnu [called Nârâyana-kavaca], to collect the wealth and hand it over to the great Indra [compare B.G. 9: 31]. 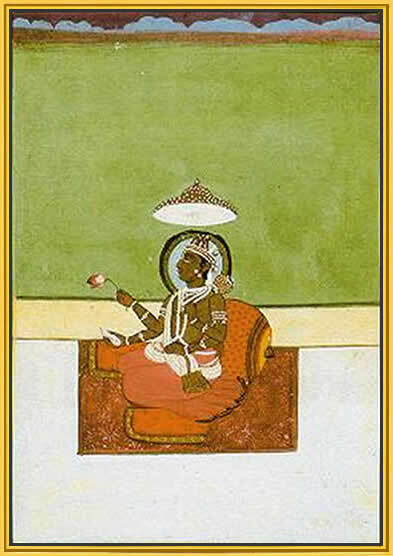 The picture shows Brihaspati, the divine sage and tutor of the gods. Source.